Deutsch: Martin Marcantonio Luciano Scorsese [skɔːɹˈseɪzɪ] (* 17. November 1942 in Queens, New York) ist ein US-amerikanischer Regisseur, Drehbuchautor und Filmproduzent italienischer Herkunft. English: Martin C. Scorsese (pronounced /skɔrˈsɛsi/; born November 17, 1942) is an American film director, screenwriter, producer, actor, and film historian. Español: Martin Marcantonio Luciano Scorsese (n. Flushing, Queens, Nueva York; 17 de noviembre de 1942) es un director, guionista, actor y productor de cine estadounidense. Français: Martin Scorsese est un producteur, réalisateur et scénariste américain né le 17 novembre 1942 dans le Queens, New York (États-Unis). Italiano: Martin Marcantonio Luciano Scorsese (New York, 17 novembre 1942) è un regista, sceneggiatore, attore e produttore cinematografico statunitense, di origini italiane. Nederlands: Martin Scorsese (Queens (New York City), 17 november 1942) is een Amerikaans filmregisseur van Siciliaanse komaf. Polski: Martin Scorsese (ur. 17 listopada 1942 w Nowym Jorku) – amerykański reżyser, scenarzysta, montażysta, aktor i producent filmowy. Português: Martin Scorsese (Queens, Nova Iorque, 17 de Novembro de 1942) é um premiado cineasta norte-americano. Suomi: Martin Scorsese (s. 17. marraskuuta 1942 Queens, New York, Yhdysvallat) on Oscar-palkittu yhdysvaltalainen elokuvaohjaaja ja -tuottaja. 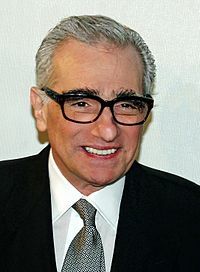 Svenska: Martin Marcantonio Luciano Scorsese, född 17 november 1942 i Flushing, Queens, New York, är en amerikansk filmregissör, manusförfattare och producent. Pages in category "Martin Scorsese"
Media in category "Martin Scorsese"
This page was last edited on 22 February 2019, at 12:27.